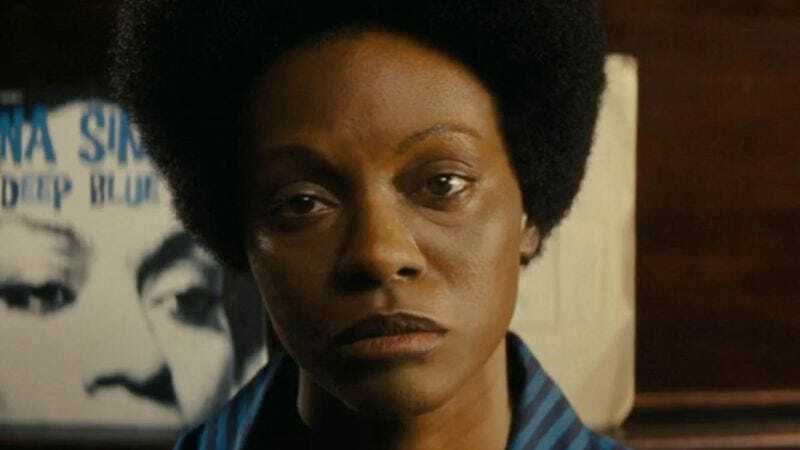 A quick rundown of the preceding controversy: When Zoe Saldana was cast as Nina Simone in Cynthia Mort’s biopic, the news was met with a hefty dose of skepticism. Simone’s estate, led by her daughter Simone Kelly, objected to the actress’ casting, citing the lack of a resemblance between the two women and raising issues of colorism, as well as decrying the fictionalized romance between Simone and her nurse-turned-manager (played by David Oyelowo in the film). The set photos that were subsequently released did little to assuage concerns over Saldana’s portrayal of the “To Be Young, Gifted, and Black” singer. Lieberman goes on to criticize the darkening of Saldana’s skin for the role, as well as the prosthetics given to the actress to “transform” her into Simone: “[N]ot every actor can play every role, even if you are of the same racial background.” But ultimately, Lieberman appears concerned that the more sensationalized aspects of Nina’s production—Saldana’s casting, the romance created for the plot purposes—will overshadow Simone’s real-life work as a civil rights activist, as well as her struggles with mental illness.